Character Analysis can be tough for young readers. It requires a reader to understand a character’s thoughts, feelings, and actions based on the setting, the character’s interactions with others, and the changes they undergo. 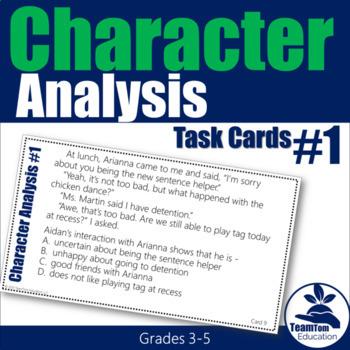 If you are introducing character analysis or looking to deepen reading skills, take a look at the free of these character analysis task cards. What does __ learn in this story? What does __ mean when he/she says __? Which sentence best describes __ when he/she __? In this story how are __ and __ alike? Who Are These Task Cards For? 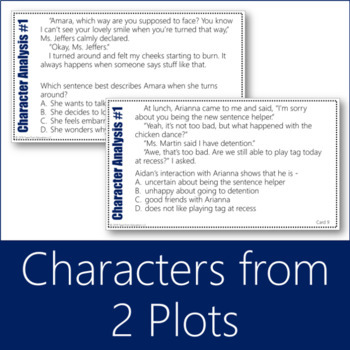 These character analysis task cards are perfect for 3rd-grade and 4th-grade on-level readers. 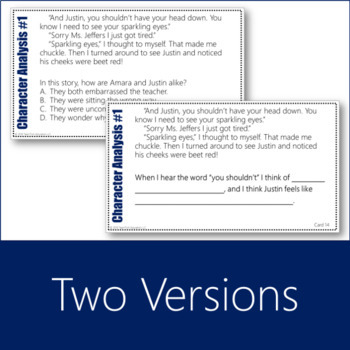 The readability of the task cards are perfect for 5th-grade remediation and intervention. Utilize as a whole class scoot, within small groups, independent work, or in a literacy center. You students will be able to read each card to determine the feelings of the character while citing evidence to support their thoughts. 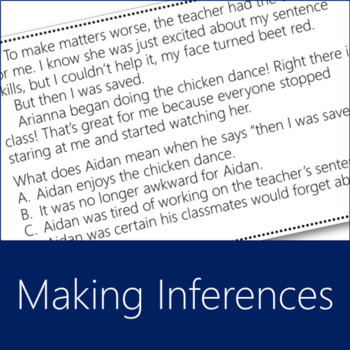 TEKS 3.6F, 4.6F, 5.6F: make inferences and use evidence to support understanding. TEKS 3.8B: explain the relationships among the major and minor characters. TEKS 4.8B: explain the interactions of the characters and the changes they undergo. TEKS 5.8B: analyze the relationships of and conflicts among the characters.